I cook a lot of German and Scandinavian food. It fascinates me how little we Americans really know about this food, or at least its potential. Neither cuisine is necessarily heavy, brown and boring. But they do rely heavily on smoked meats, like bacon. I looked around for an “authentic” German bacon recipe, but came up short. While I suspect that most bacon in Germany and thereabouts is simply cured with salt and smoked, I was looking for something with a little more regional character. And since I did not find one, I went about creating one. I started with some pork belly. No reason this would not work with a fat wild boar, but it’d need to be a fat one. Then I tossed in a bunch of Germanic-Northern European flavors: German brandy, mustard, celery seed, caraway, garlic, marjoram and black pepper. Cured it 3 days in the fridge, turning it over each day, then off to the smoker. Now I suppose you could smoke this over any wood you wanted, but to me, if it’s going to be German it needs to be smoked over beech, alder, birch or oak. I chose oak. The result is perfect with German food. You mostly pick up the black pepper, celery seed, mustard and caraway, but you actually do get a hint of the brandy and the marjoram. The garlic is pretty subdued. 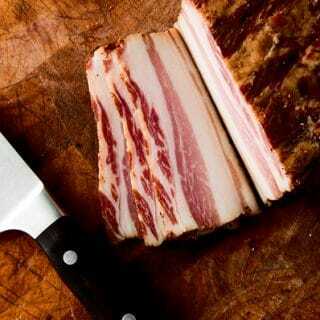 I’ve sliced this and eaten it like regular bacon, but I mostly use it in stews and braises. This recipe is based on a 3-pound slab of pork belly, and it can be scaled up or down accordingly. You will want to get your hands on some curing salt, which you can get in most butcher shops or buy online. Everything else you can find in a supermarket. I smoke the bacon over oak. If you can't find oak, go with -- in order of preference -- alder, birch, apple, maple or hickory. 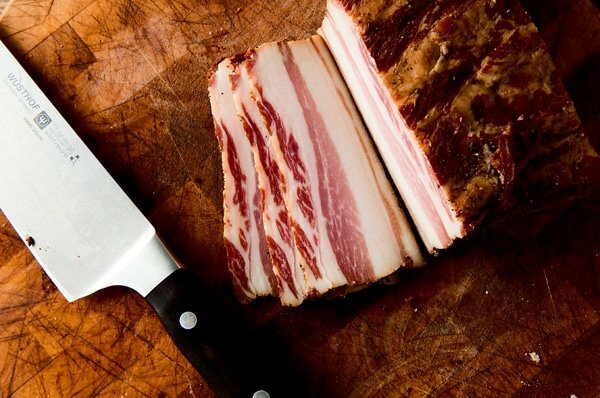 Once cured and smoked, this bacon will a month in the fridge or longer in the freezer. Find a container that will just about hold the pork belly, or use a heavy duty, sealable plastic bag. Massage the pork belly with the brandy over a bowl. If you have any extra brandy, pour it into the container or plastic bag. Mix all the dry ingredients for the cure together, then massage that into the meat. Put the pork and any remaining cure into the plastic bag or container, seal it and set it into the fridge for 3 to 5 days. Every 12 hours or thereabouts, turn over the pork. This helps distribute the cure evenly. Take the pork belly out and quickly rinse off the cure under cold water. Some cure will stick to the meat -- leave it, as it adds flavor. Pat the meat dry with paper towels and set on a cooling rack. Put the rack under a ceiling fan or in another cool, breezy place and let it dry for at least 2 hours, preferably 4. Or, you can put the meat on a cooling rack set in the refrigerator uncovered and leave it overnight. When you are ready to smoke, smoke the bacon at about 225°F for 4 to 6 hours. I never check internal temperature on the bacon, but if you are looking for a temperature, between 140°F and 165°F is fine. This is a pretty well-cured bacon so you don't need to cook the hell out of it. Allow to cool before using. You can find lots of recipes for bacon and other smoked meats and fish here on Hunter Angler Gardener Cook! I’ve used this recipe 3 time now, always good. This time with my own goat whey raised Berkshires. Oh and in Tasmania, eucalyptus smoked. It’s a great recipie to mess with a little.